I know there’s a popular cable show called “Vikings.” I’ve watched a few episodes, but, as an historian and art historian, I find it really doesn’t address many of the cultural contributions Scandinavians (Sweden, Norway, and Denmark) made to Western art. I’m especially appalled by the emphasis on the violence. Granted, the Vikings weren’t the most loveable people from the period of the late Roman Empire (c. 284–500 ce) to the early Romanesque period (c. 1000–1200), but, come on, their culture was about more than just plunder and pillage. I think their aesthetic contributions are comparable to those of the “Christianized” Anglo-Saxons in Britain in the period between the 700s and the 1000s. One of their greatest legacies is their artistry with wood sculpture, relief, and architecture. 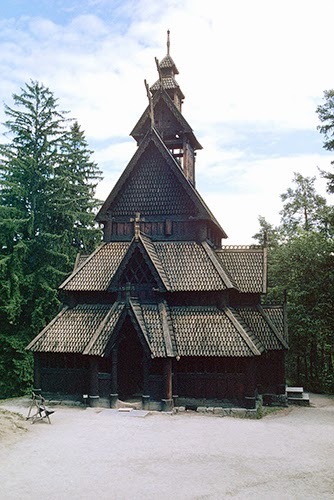 Until Scandinavians accepted Christianity (Denmark in the 900s, and Norway and Sweden in the course of the 1000s), their buildings were exclusively of wood. It is often theorized that this reliance on wood as a building material is what made the Vikings such able ship-builders. As seafaring folk, the Vikings raided and established settlements in Britain, Normandy, and Tuscany, and their raids extended sometimes to Spain, Germany, and western France. Their master seafaring abilities enabled them to establish colonies in Iceland (c. 860 ce) and Greenland (c. 965 ce). 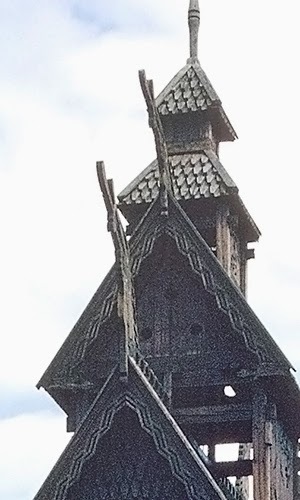 In form, the stave churches were usually in a centrally planned, Greek cross-like organization (wings of equal length from a central worship area). The introduction of stone church construction from mainland Europe, influenced by the blooming Romanesque style of the late 1100s to early 1200s, essentially ended the stave church style, although it was employed sporadically in Scandinavia and the British Isles. Luckily, many stave churches have survived to this day.